IHG® Rewards Club Members receive the best available rate, daily breakfast for 2 and earn 1,000 bonus points per night! Get up to 20% off when you book in advance on stays through June 2019! Relax and enjoy contemporary hotel accommodations along the scenic San Diego waterfront and wake up to breakfast daily. 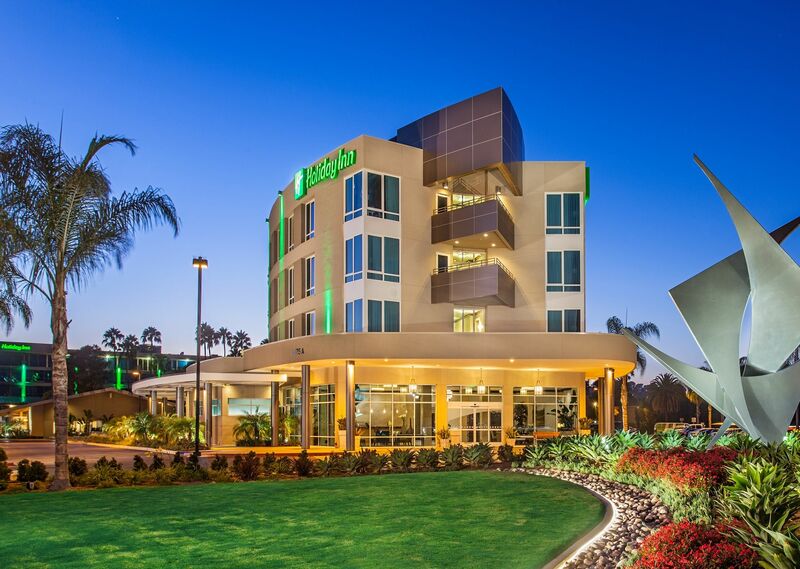 At Holiday Inn San Diego Bayside we are not only kid friendly, we are kid preferred! Stay 1 or more nights and leave 1 parked car at the hotel for up to 10 nights. Located near the marinas and walkways of the scenic San Diego Bay, Holiday Inn Bayside boasts a unique look and a fresh, contemporary design. Our San Diego hotel offers a relaxing experience, allowing those traveling on business or pleasure to delight in extraordinary bay views and a tropical recreation area. Our Point Loma home puts us near all the best San Diego attractions, including great restaurants and shopping. Guests can dine at our onsite restaurant, Point Loma Café, serving fresh California cuisine for breakfast, lunch and dinner daily. Rooms and suites offer stylish furnishings, complimentary WiFi, and flat screen HDTVs with premium cable channels. Our building features teak ceilings, Spanish fretwork, Mexican antiques, and plush seating for the ultimate San Diego retreat. As part of our warm, welcoming style, our staff is ready to help you with everything from complimentary shuttle rides to the airport and professional event planning services, so you can host a memorable event in one of our beautiful ballrooms. Conveniently located on North Harbor Drive across from America's Cup Harbor, this comfortable and contemporary restaurant features hearty portions of the classics and our own special creations. These non-smoking guest rooms and suites surround our lush putting green area and swimming pool. All rooms are equipped with a refrigerator, Keurig coffee maker, and free WiFi. These rooms are located in a 2-story building with exterior corridors and stairs only. Our tower guest rooms and suites, located just west of our pool area, feature décor that combines a sense of modern sophistication with a warm, restful feeling. All rooms in the Tower Building have interior corridor access from 1st to 5th floor and offer a Keurig coffee maker, refrigerator, HDTV, and free WiFi. All rooms are equipped with our highly popular Simmons St. Chappelle mattress and an option of firm or soft pillows to guarantee a night’s rest that will leave you refreshed and ready for the next day! Plan your next meeting, reunion, wedding or special event at the Holiday Inn Bayside overlooking scenic San Diego Bay. Our staff's attention to service and beautiful bay view facilities make our property the perfect choice to help you host a one-of-a-kind event. Fast paced and endlessly exciting, Extreme Sailing is the nontraditional water sport that has taken the sailing community by storm. Dive in at the Holiday Inn Bayside! Fire pits on the Bayside Patio. Holiday Inn Bayside lobby The Holiday Inn Bayside is perfect for all kinds of groups! Banquet set up on the lawn at Holiday Inn Bayside. Holiday Inn Bayside is perfect for social events. Holiday Inn San Diego Bayside Meeting Space Margarita by the fire, anyone? Grab a beer at the Bayside Bar. Our world-famous ceviche! Holiday Inn San Diego Bayside Accessible Guest Room at the Holiday Inn San Diego Bayside Come say 'I Do.' with us! Our Bayside Ballroom is the perfect venue for a wedding. Point Loma Cafe Tortilla soup at Point Loma Cafe Holiday Inn Bayside: perfect for meetings! Bayside Bar at dusk. This isn’t your typical Holiday Inn, it’s better. Rooms are huge and the bathrooms are very nice. The pool area is a little small but they make up for it with: outdoor seating area with lights & fire pit tables, shuffleboard, miniature golf & bean bag toss. Oh...and the Happy Hour specials aren’t bad either! Staff was super friendly and accommodating. I've stayed at this hotel twice. Both times I had superb rooms looking at the marina. The rooms were large and comfortable with air conditioning that worked quite well and quietly. The beds were some of the most comfortable I've ever slept on. The pillows and bedding were EXACTLY what I want. The showers were spacious and had plenty of pressure and hot water. I like this IHG property and will stay here again when I come to San Diego. I stayed here for a convention. It's location from the airport is extremely convenient. It is immediately across the street from the bay and many shops / restaurants / boat tours, etc. They have multiple buildings, with quite a bit of space. My room was fairly spacious and clean. The food they served at our meals was fresh and tasty. I had a pleasant 2-night stay. 1 night stay. Nice, clean hotel. Near San Diego airport and the Marina. Nice, friendly staff. I inadvertently booked myself 2 rooms. The front desk agent, ( I don't remember his name), cancelled the second room without a penalty and without judgement.! I recommend this hotel. Will stay again. My husband & I were recently in San Diego for a conference at the Holiday Inn Bayside Hotel. Very nice! Lots of amenities- pool, hot tub, workout room, restaurants, shops, etc. Not even a block to the waterfront boardwalk! Catch a trolley right outside the hotel & take a historical city tour!! Fun! I recently stayed at this hotel and was so pleased with every aspect. The room was very well appointed and clean. The best part of my stay however was the service I recieved from the staff. The food from room service was amazing, fast and plentiful. This is a great hotel, great location, great staff. This hotel has a great airport/cruise port shuttle service. The location of the hotel is a short way from the downtown area and is quiet with a unique comfortable feel. The staff are friendly and helpful, the bar food excellent in selection and quality. The cafe had a great breakfast menu with fantastic service. Our server Ron went above and beyond to make us feel welcome and part of the cafe family. This hotel embodies all of the reasons I stay at Holiday Inns.